Double demerit points apply all year round in Queensland. If you commit a traffic offence anywhere in Australia, demerit points may be applied and recorded on your traffic history. you have been issued with an order for an interstate offence. The number of demerit points you can get before you receive a sanction depends on your licence type. If you get more demerit points than your licence type allows, your licence may be suspended or you may need to serve a good driving behaviour period. open licence – 12 or more points. Note: Your points do not reset when you progress from one licence type to another. If you get 4 or more demerit points within a 1 year period on a learner or provisional licence, you will be sent a licence sanction notice. If you were on a learner licence at the time of the offences, you will have to serve a 3 month suspension even if you have already upgraded to a provisional licence. If you’re driving on an interstate or overseas licence and you get too many demerit points, we will send you a notice telling you that your authority to drive in Queensland will be withdrawn. The length of your suspension period will depend on the type of licence you held when you committed the demerit point offences. If you hold a learner, P1, P2, provisional or probationary licence, we will send you a licence sanction notice if you get 4 or more demerit points within any 1 year period. 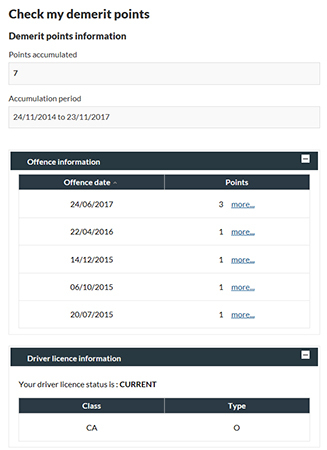 If you hold an open licence and you get 12 or more demerit point offences within any 3 year period, we will send you a licence sanction notice. Demerit points included on a sanction notice are considered ‘dealt with’ and are not counted again. You can check your demerit point balance using the demerit points online service. You’ll see how many points you’ve accumulated, the time frame that’s being counted, your offences recorded in that time frame and the status of your licence. You can apply for your traffic history dating back to 8 April 1993.
driving restrictions and sanctions (e.g. good driving behaviour, late night driving restriction).